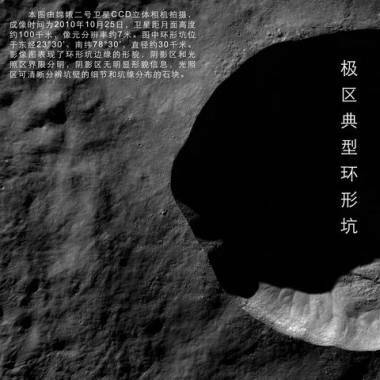 China's Chang'e 2 probe took this picture of the Laplace A crater as it flew over the moon's Bay of Rainbows on Oct. 28. A 3-D elevation model of Sinus Iridum shows a generally flat surface, pockmarked by craters that stretch as much as 1.2 miles (2 kilometers) wide. Clefts are cut into the floor of Daniell Crater, situated in the lunar region known as Lacus Somniorum or the Lake of Dreams. 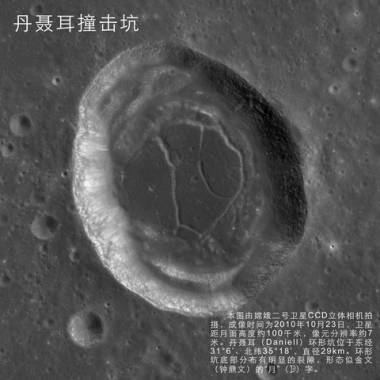 An image from Chang'e 2 shows a lunar crater in high relief. The first pictures from China's latest lunar orbiter, Chang'e 2, focus on a region of the moon known as Sinus Iridum, or the Bay of Rainbows. There's a reason why this locale was chosen: China is thinking about sending a lunar lander to the same region three years from now. 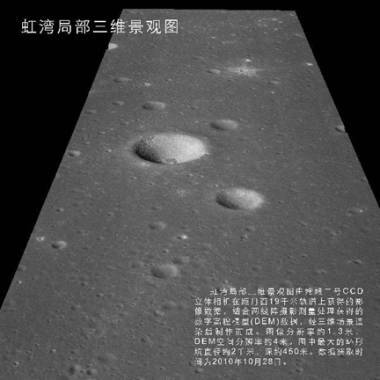 Chang'e 2 has taken pictures of other areas on the moon where the Chang'e 3 lander and rover might go. "The exact spot for a soft landing has not been decided yet," Yan Jun, chief scientist for China's lunar exploration project, said Monday in a China Daily report that was passed along by NASA's Lunar Science Institute. 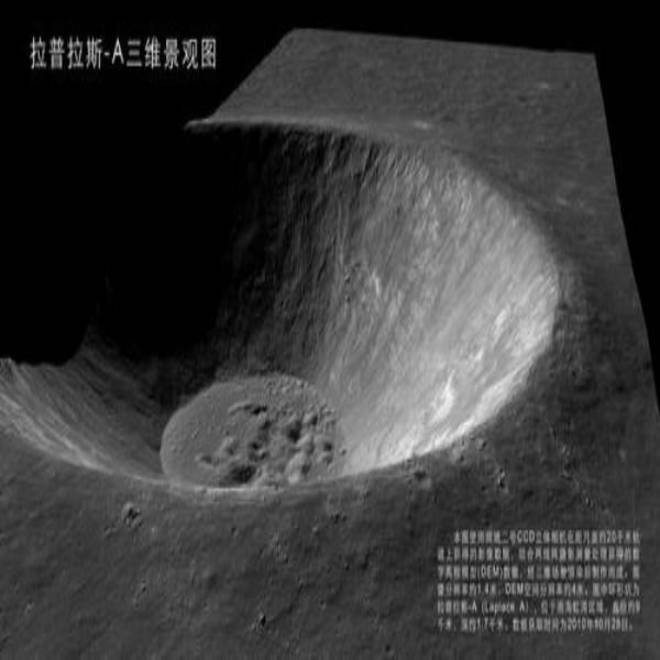 The Chinese National Space Administration said that one of Chang'e 2's photos showed an area where the surface was "quite flat," with craters and rocks of different sizes. The biggest crater in the field of view measures 1.2 miles (2 kilometers) wide. This week's pictures were unveiled by Chinese Premier Wen Jiabao at an event celebrating Chang'e 2's success. The probe was launched on Oct. 1 and is scheduled to continue beaming images and scientific data back to Earth for another five months. Chinese officials have hinted, however, that the mission would likely be extended. Chang'e 2 may even leave lunar orbit to "test China's capability to probe further into space," according to chief designer Huang Jiangchuan. If China follows through on its most recently announced plans, it will be participating in Russia's Phobos-Grunt unmanned mission to Mars next year, and then launching its own probes to the moon and Mars in 2013. China has talked about sending humans to the moon in the 2020 time frame -- and human missions to Mars are on the country's long-term agenda. Update for 12:40 p.m. ET Nov. 13: It's not as if China is the only country with a probe circling the moon. Let's not forget that NASA's Lunar Reconnaissance Orbiter has been up there for more than a year and is continuing to send back fantastic imagery.